Disco lives? The soft opening of PP Club! Friday night I stopped by the soft opening of PP Club. The combination disco / karaoke is located in the far corner of Tsim Sha Tsui East, close to Hong Kong Polytechnic University and the footbridge to the Hung Hom Coliseum. PP Club claims to be the biggest club in Hong Kong at 20,000 square feet, but what’s it like inside? Arriving at PP club, there was a long line of floral arrangements stacked up outside the entrance. After walking past the reception, I took the elevator up to the second floor. My first thought is that having just one medium-sized elevator is a potential bottleneck if dozens of people arrive or exit at once. Newer clubs tend to have multiple elevators to whisk partygoers to their destination. Exiting the elevator, there’s a small reception lounge to the left, and a series of hallways to the right that lead you to the main disco area. The karaoke rooms are located down a corridor just before you hit the disco. PP Club occupies a large area indeed, but a great part of the footprint is actually utilized by the private karaoke rooms. That said, the main disco is still a cavernous space that betrays its past life as a former cinema. The sloping room is a multi-terraced space that starts with the main bar at the top and ends with a dance floor and stage at the bottom. In between there are several levels with areas of tables and stools. Along both sides are large circular booths built into the walls. PP Club already had a good amount of guests when I arrived for the reception at 9:30. There were people on the dance floor and along the main bar at the top. The light rigs were up and running, shooting the crowd with beams of red and green lasers. Having to head to Central for a previous engagement, I decided to check back later since I was curious to see what the scene would look like late-night. By the time I returned at around 2:30 am, the disco had thinned out considerably, or perhaps guests had migrated to the karaoke rooms (though I didn’t see an overflow of people like you normally do on big karaoke nights.) Finding the place a little on the quiet side, I left after five minutes. With a lack of other discos now open in Tsim Sha Tsui, expect PP Club to get popular with the same crowd that frequented places such as HOT, Cyber and 348. Keep in mind that in the first few weeks, the police will likely be stopping by and turning on the lights for a “license check”. Sh*t Sandwich, the 90’s edition part 2! Previous articleHong Kong Fashion Week 2008! Next articleChinese New Year… coming soon! Droom Pub, 1/F., Katherine Hse. Actually it has opened for a month more, but they r doin their opening on 22 Jan, where will have Sam Lee and Frankie Lam as guest DJ. Interested? Aaiya! Too short notice. Next time tell me earlier… I was at CEO, then HALO, then D.I. tonight… pretty good for a Tuesday night! Droom sounds interesting. I heard Sam d.j. a few weeks ago and I liked what he played. Frankie d.j.ed the opening of PP Club on Friday night. Hope it was fun. the club looks great but what is the music style in this new club ? I’m not sure what the music will be like on a normal night. PP Club lists several different d.j.s on their website, and each of them plays a different style of music. They range from Hip Hop to Breakbeats and House. As far as the design of the place, the lights always make things look cooler! just wonder about the disco in empire centre/tst, was it already shut down? I’m not sure! I can’t think of any big place that’s in that building, but I haven’t been at that exact point at night recently. 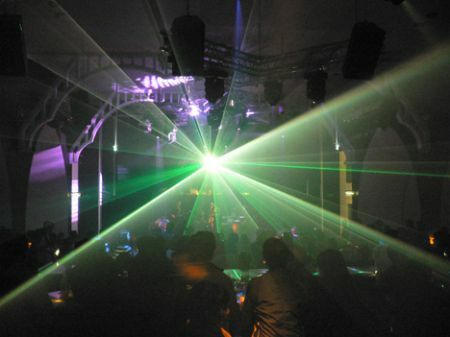 do u know other disco,s with atmosphere similar to former cyber8, btw PP quite expensive. 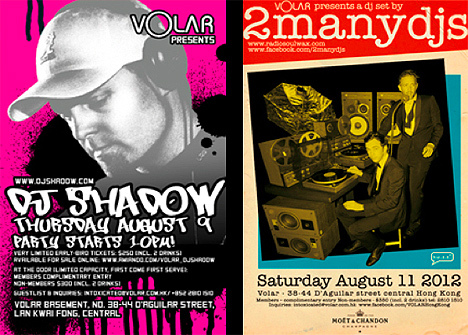 DJ Shadow + 2manydjs at Volar!